DISPLAY 1.77'' 128 x 160 LCD. The LCD Screen shows data usage, signal strength, new messages and more. USAGE TIME Battery in use time up to 14 hours. 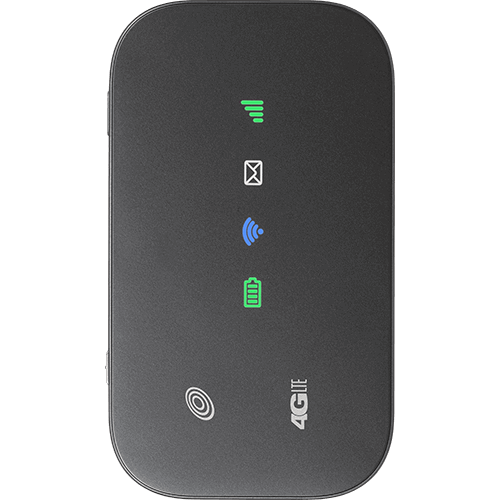 Straight Talk Mobile Hotspot provides quality wireless internet access on the go or at home. You can connect your Tablet, Laptop or Smartphone. You'll be able to check emails, watch videos, play games, surf the web and stay connected. Connect up to 10 Wi-Fi® Enabled Devices. LED Icon Indicators. Wi-Fi® Power-Save Options. Compact - Fits in your Pocket. Enjoy No Contract Internet Connection. You will need a Straight Talk Mobile Hotspot Data Service Plan to complete your activation. Straight Talk Mobile Hotspot will not work with the Straight Talk Unlimited Service Plan Cards. 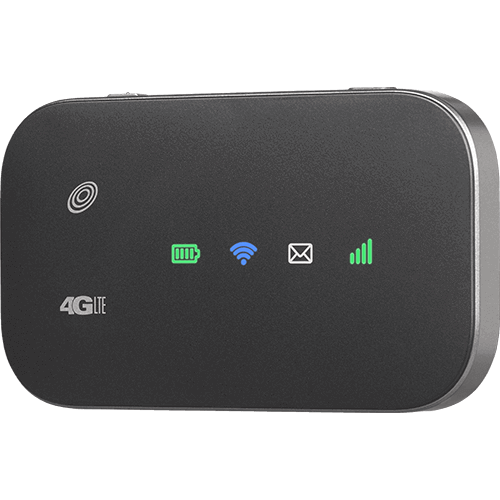 4G/LTE icon will appear on the LCD screen according to the network being connected. STANDBY TIME Standby Time up to 10 days. TALK TIME Battery in use time up to 14 hours. Activation Card and Service Guide. SCREEN 1.77'' 128 x 160 LCD. The LCD Screen shows data usage, signal strength, new messages and more. BROWSER The Z291DL mobile hotspot supports Internet Explorer® (7.0 or later), Firefox® (15.0 or later), Opera™ (10.0 or later), Safari® (4.0 or later), and Google™ Chrome™ (10.0 or later). BATTERY Battery in use time up to 14 hours. Includes $75 Mobile 7 GB Data Service Plan with 60-Day Service. For use with Straight Talk BYOT and/or Hotspot. Plans include Data and Service days only. Voice, text and messaging services are not provided or included. Nationwide Coverage on America's Largest and Most Dependable Networks. Includes $50 Mobile 5 GB Data Service Plan with 60-Day Service. Includes $40 Mobile 4 GB Data Service Plan with 60-Day Service. Includes $25 Mobile 2 GB Data Service Plan with 30-Day Service. Includes $15 Mobile 1 GB Data Service Plan with 30-Day Service. Plans include the following service options: 1 GB Data (30-day), 2 GB Data (30-day), 4 GB Data (60-day), 5 GB Data (60-day) and 7 GB Data (60-day). Plans are subject to change. Plans are for use with Straight Talk Hotspots only. Non-Hotspot Plans, for use with other Straight Talk products, will not work with Straight Talk Hotspots. Plans include data and Service days only. Voice, text and messaging services are not provided or included. International service is not available. Your Straight Talk Hotspot will only operate when your Service is active and You have a positive Service balance in your account. Your "Service End Date" is the last day of your Service period. When you add or refill Services, your Service End Date will be reset to the number of Service days purchased. With each refill of your Service, You will have the option to apply the refill at the moment ("now") or put the amount in your Straight Talk Reserve ("Reserve") (see section 3(c) below for more information about Straight Talk Reserve). Redemptions added to Reserve will be applied when your current service expires. If You redeem early, before the end of your current 30 day plan cycle and You still have remaining days and data balance, You will lose the remaining days and balance You had prior to the redemption. Any unused Service balance(s) that exist at the time You refill your Service or at your Service End date will not carry over or accumulate and automatically expires. Device Usage Limitations: While up to five (5) devices may be connected to your Straight Talk Hotspot at one time, a single connected device will experience optimal speeds. Performance will be reduced if multiple devices access data through the Straight Talk Hotspot simultaneously. Actual data speed, availability and coverage will vary based on device capabilities, usage, your location and network availability. Service is not available while roaming. Other limitations, terms and conditions of service apply. Straight Talk reserves the right to terminate your service for unauthorized or abnormal usage. Please refer always to the latest Terms and Conditions of Service at straighttalk.com. If you are not satisfied with your device and/or accessory purchase, simply return it to us within 30 days and we will replace it or give you your money back. It's that simple. Straight Talk Service Cards, and /or unused minutes are non-refundable. It takes up to 30 business days to process the return and credit your account. Credit for returned phones and/or accessories will appear on your credit card statement between 1-2 billing cycles. Service Plan cards are not refundable. If the Service Card is purchased as part of a Straight Talk mobile hotspot bundle, the mobile hotspot purchase can be returned/refunded however the Service Card is not refundable. STRAIGHT TALK will repair or replace your device and/or accessory that contains a manufacturer's defect that hinders or prevents its proper operation for up to one year (90 days on all accessories) from date of purchase (proof of purchase required). All offers are subject to change or discontinuance by STRAIGHT TALK Wireless at any time without further notice. Straight Talk Wireless reserves the right to limit quantities and to reject or cancel orders in its sole discretion. Product is not for resale or distribution.